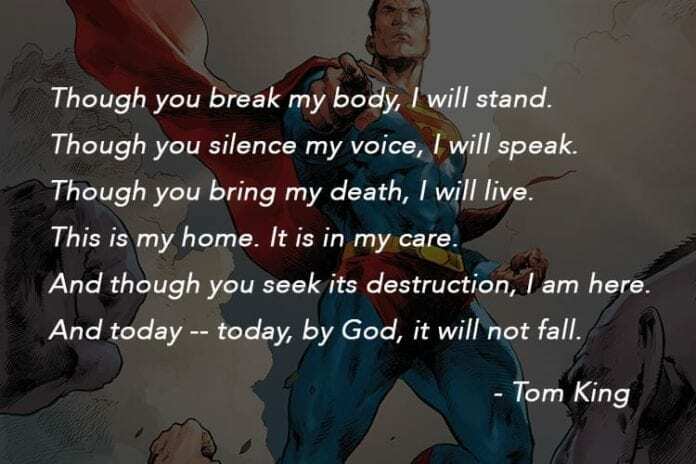 Tom King may have put together the greatest collection of 539 words in the history of comic books with Superman’s speech from Heroes In Crisis #5. I make a very bold claim, but once you strip away the panels, the pencils, the inks, the colors, all the baggage of the world, and just read the letters and hang on to every word, you’ll understand. Superman’s speech should resonate in your bones, and you should feel a slight chill in the air. Below is the transcript for the comic book, find yourself a nice quiet place, and read King’s words. Then stop, look around, and remember when and where you were at this moment. Now, that being said, we would like to address the concerns some have expressed with regard to the function of this facility. A place we call Sanctuary. And why we kept it out of the public’s eye. Sanctuary is a place of respite. A place where those who live their lives ensconced in violence may seek and find a moments peace. Where those who have absorbed the lasting blows of that life of violence may seek and find a moment to heal. The question then arises naturally. If we need peace, if we need to heal, if we need anything, does that then mean we are broken? Are we somehow now forever unworthy of your trust? Does that then mean that you who may not have fought are now vulnerable? Does that mean you, all of you, should always be afraid? We… I understand this dilemma. This fear. Your fear. And I hope today, that I might clarify it. That you have accepted me, an alien, as your friend, is the greatest joy of my life. And I have… tried to continue to earn that friendship. Every day. Every second. I have endeavored to be worthy of that highest honor. The label some have kindly — very kindly — given me. That of… hero. And I have seen time and again my colleagues, my super friends, these true heroes, bearing this same marvelous burden, engaged in this same endless struggle. I have watched persons from every country, every background, rise with power to battle the worst evils. To shout in the face of ignorance and defeat that there shall be another day of dignity for our world. There shall be another day of honor for our people. Battling through unimaginable torment, they have taken their place along the barrier that divides us from chaos and death, they have stared into the certainty of annihilation. Though you break my body, I will stand. Though you silence my voice, I will speak. Though you bring my death, I will live. This is my home. It is in my care. And though you seek its destruction, I am here. And today — today, by God, it will not fall. What you must know, what I know, what I most want you to understand. The nightmares the will forever endure. It exists to help these heroes recover from the pain, to help them recognize themselves under these scars, to help them wake from these nightmares. But its existence, it should not scare you. On the contrary. It should comfort you. This suffering. This need for healing. It is not the mark of a madman. It is the wound of a warrior. A sign of their love of truth. Their hunger for justice. And their fight for the American way. What did you think of Heroes In Crisis #5? Comment below with your thoughts. If it had been just the quote you used on the image, it would have been inspiring in the face of danger. The whole text… I didn’t even get halfway through (or to the only salvageable words) and I was exceedingly bored.